In Mr. TNT, your objective is to control a red ball with eyes to defuse all the bombs on a grid, while avoiding lit fuses. 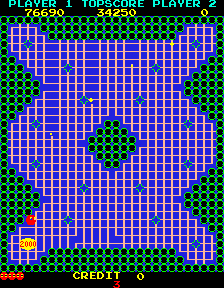 As you move around the grid which is made up of bomb fuses to collect the bombs, the area you travel over is removed. This means you can't backup over your tracks, so you must keep on the move. following your route to the next bomb, watching out for dead ends and all the while being pursued by hostile enemies intent on killing you. The fuses always home in on your position, so you must try at all times to make a safe route between bombs. You can't stop once you are travelling in a straight line, but you may pause on corners to ponder which route to take next. You clear the stage by defusing all of the bombs or by removing all of the fuses. 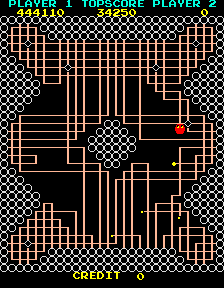 You then advance to the next stage, which has a different grid layout and more fuses to encounter. The fuses are removed from the grid if they collide with each other or if they reach the end of a line at the edge of the grid (dead end). The fuses also speed up on later levels making them harder to avoid. You start the game with three lives and by default an extra life is awarded every 75,000 points. Points are scored for removing grid sections and defusing bombs. You lose a life if you collide with a fuse or hit the edge of the grid at a dead end. Grid section - 10 points x stage number. Defusing bomb - 1,000, 4,000 or 8,000 points. There are infallible patterns for every stage. If you find one which works once in a game, use it again the next time you are on that stage. If you are heading towards a dead end, stop on a corner, and wait for the fuses to burn themselves out - better than losing a life! On the early levels clear as much of the maze as possible for extra points. If you manage to cut the fuses off completely from you, feel free to leech points by clearing as much of the maze as you can. Use the blocks inside the grid to keep the fuses at bay. You can force them to take a particular route by clearing the grid and leaving them no option.